I find it strange I have never been to Archipelagos before! I have lived in Brighton for 11 years and have always prided myself in knowing all the best places to dine out; the first to try out the new restaurant on the block; the first to tell my friends of ‘this great new place I have found’! Instead, I’ve heard friends raving about Archipelagos and somehow this wonderful little restaurant has slipped through my net of gastronomic ‘must tries’! Maybe it is simply my tendency in recent years to sway towards Asian cuisines. To be honest, it has been a while since I sat down to a Mediterranean meal in the UK, but I am more than happy to treat my taste buds to something different. Finally, I am now on my way to sampling this glorious Greek, I have heard so much about. 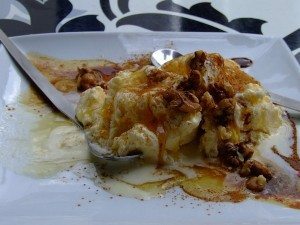 I have always had a real fondness for Greek food and hospitality! I remember many meals out with my grandparents in London when I was much younger, at this intimate little taverna around the corner from their flat, where the owners knew them by name. When I was a teenager, I spent my first holiday away from my parents with two friends in Greece, with a Greek friend and his family. We were spoilt ridiculously by their kindness, fantastic food and endless supply of wine. My partner and I have also holidayed in Greece together, so I am excited at the prospect of finding a little taste of those holidays and these memories here in Brighton. 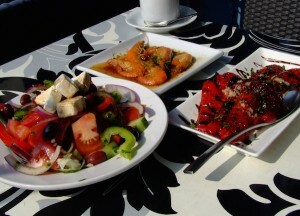 Archipelagos – taverna/restaurant – is found on Western Road, just down the road from my flat. It couldn’t be more conveniently located for us, stranger still that this will be our first visit. As it is a beautifully sunny day, we have made the decision to head to there for a late lunch, rather than dinner, in order to enjoy perhaps our last opportunity for al fresco dining this year. 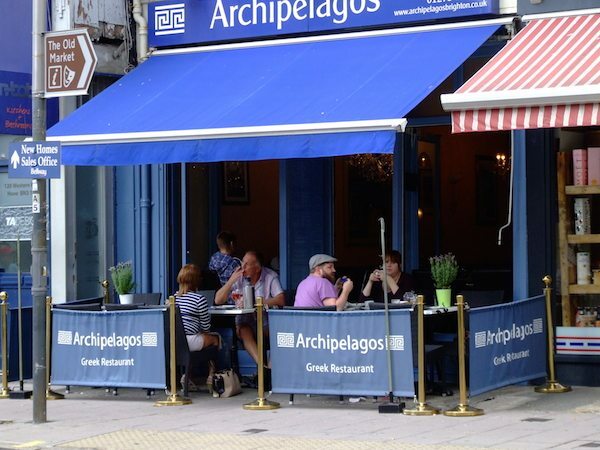 From the outside Archipelagos is undoubtedly a Greek restaurant, with the iconic blue and white paint work and awning, in vibrant contrast to the other shops and restaurants on this strip. The décor inside is modern, but the restaurant is small enough for the dining experience to still feel intimate. Our waiter immediately greets us and seats us at a table in the sunshine. There are not many tables in the small patio area at the front of the restaurant and I can imagine it gets very busy on sunny days. I think today – maybe due to the time, somewhere between lunch and dinner – we have been lucky to get our spot. Once settled, our menu is promptly bought over, along with a jug of water for the table, and our drinks order taken. 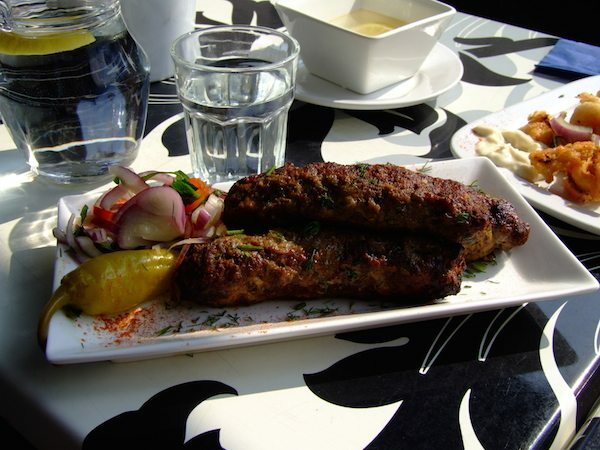 The menu is modest, but full of mezedakia favourites. 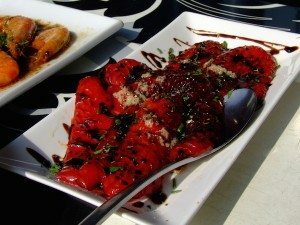 As well as this, they offer traditional Greek main courses such as, Kleftiko, Stifado, Souvlakia and Moussaka among others. They do also offer a special set lunch menu that allows diners to pick a starter, main and a soft drink or glass of house wine for only £11.95. Everyone dining here today seems to be in the holiday spirit. I am sure the sunshine is helping, but aside from that, Archipelagos is just that kind of place. Our neighbours sip their rose and ask us if we have eaten here before, as we try to pin down our choices from the meze selection. They are gushing about the food and tell us we are in for a treat. When we ask for guidance, our waiter advises us that we won’t want more than three meze each. I get the feeling that three each is a large order, one he doesn’t often take around lunch time. We have prepared ourselves for a healthy amount of food today; we had a small breakfast and for the purposes of this review, we want to try a good selection. deliberation, we place the order; we would have everything on the menu if we could; it all sounds so appetising! All the much loved traditional meze are there: Tzatziki, Dolmadakia (stuffed vine leaves), Marides (deep fried white bate), Houmous, to name a few. For us, a nice rounded order: three veggie, two fish and one meat option. Now all there is to do is sit back, enjoy our gorgeous fresh coffees – bought to the table moments before – and the warming sunshine on our skin. 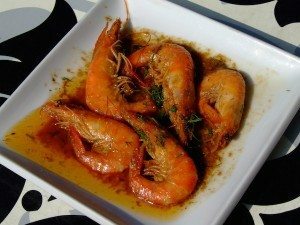 The first dishes to arrive are the Horiatiki (Greek salad), the Peperies Florinis (roasted red peppers) and the Garides (king prawns), three great looking, glistening platefuls of colour. The taste does not disappoint either! Everything is seasoned perfectly; the peppers are so sweet, they almost melt in the mouth; the feta is rich and salty against the freshness of the cumber and the ripe juicy tomatoes that make up this classic salad. As for the prawns – so simply described on the menu – they blow us away! Big, buttery, garlicy and cooked to perfection, this is a winning dish, which is devoured in moments. Amidst the ‘yummy noises’, our next dishes appear in as much glory as the first. Now we have everything, we are taken aback by the vibrancy of the dishes that adorn our table. 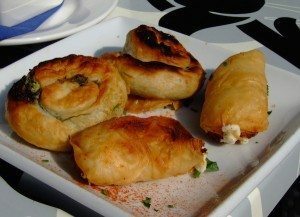 A favourite of mine: the Pitakia (cheese/spinach pie), served to us conveniently for sharing, as four individual little parcels. The spinach and the feta come separately inside the pastries, two of each kind. The pastry cracks when bitten in to; the fillings ooze out, melting and full of flavour. 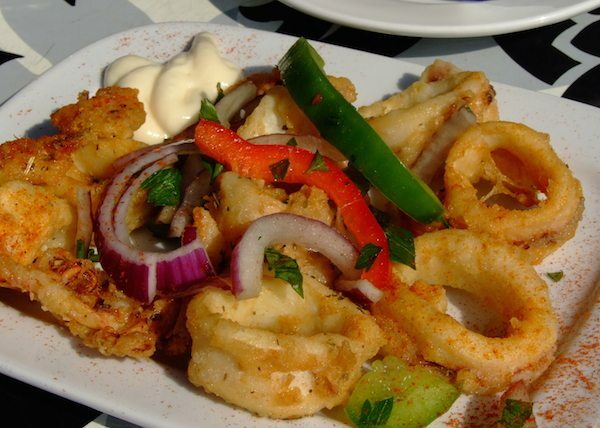 The Calamari Tiganito (deep fried squid rings) comes in two different varieties; we have chosen the local variety. This is a bit more expensive, but we consider it worth it. Again, cooked to perfection, with a crispy outside and tender inside, served alongside garlic mayonnaise, this dish is truly delightful! Finally, the only meat dish we have ordered today: the Keftedakia (chargrilled meatballs). A very generous amount of meat makes up this ‘meatball’ dish. Three long, sausage like meatballs cover the plate, making this a rather formidable finale for us to contemplate. Of course not a morsel is left; the plates are practically licked clean. Before we can even decide if we want to look at the dessert menu, we are informed that something sweet has been prepared for us in the kitchen. 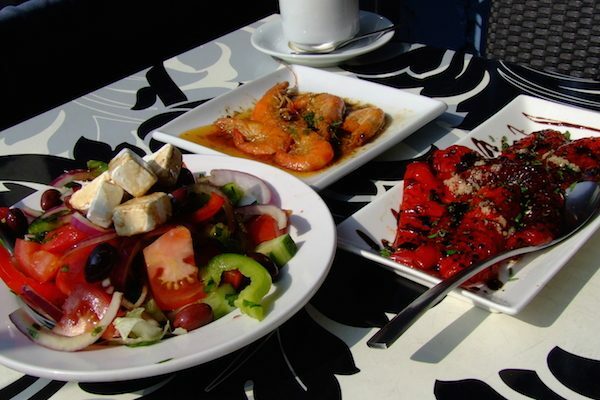 Menus are offered as well, but we are more than happy to put this in the hands of the experts here at Archipelagos. We thank them for the gesture, order an espresso each to accompany dessert and psyche ourselves up for the final leg. My partner puts it best: everything you could possibly want in your dessert is on the plate. We check the menu and think we have been given the ice cream with Tia Maria and nuts. The plate is piled high with many different elements; we are in sugary heaven. We have to keep rotating the plate to ensure the plethora of sauces, nuts and mound of ice cream, doesn’t slide off any corner of the square serving plate. We want to make sure the only place this goes, is in our tums. The espressos are rich and work wonderfully to take the edge of the sweetness of dessert. We can’t quite believe that we finish it, but we do. The walk home will be much needed! 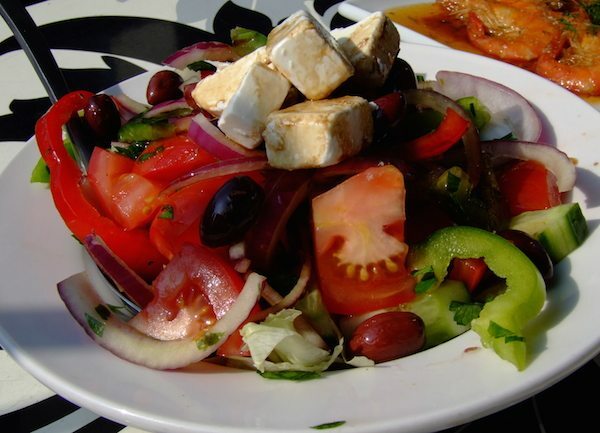 Eating fresh and colourful Greek cuisine, quite simply reminds me of holidays, sunshine, and all things that are good for the soul. Archipelagos has definitely been good for my soul this afternoon. The food is top quality and just delicious. We have experienced great service, with staff going the extra mile to make us feel welcome. To top it all off, when our bill comes we discover dessert and our espressos have been complementary. Don’t wait like I did to try this place; we both agree it has been the best meal we have had in a long time! We waste no time in organising our next visit, in fact, before we leave the date is already in the diary!